The opening film in this year’s Toronto International Film Festival was the World War I story of the Battle of Passchen-daele in which Canadian troops played a significant part. It brought once again the aspect that war is cruel and brutal, but it has created a wealth of material for collectors to seek for their collection. Museums are not the only area that has sought out military material over the years to preserve, but collectors have sought the many types of material for centuries. World War one chalkwear wall plaque. Since the collecting area is massive in this article I want to concentrate on material of the 20th Century. The massive amount of military collectibles is focused on so many different areas, but I will look at what the average collector can find and very importantly be able to afford. There are collectors that purchase the actual armoured vehicles, aircraft and even some ships of the 20th Century war period. But, the average collector searches for weapons, medals, uniforms, ephemera publications of all types. Until very recent times soldiers were not provided with their equipment by the government, but had to purchase many items themselves. Historically the concept of collecting military material began by these soldiers keeping their equipment and then into collecting the equipment of the enemy. The collecting of enemy material became not only souvenir collect-ing, but a way to show one’s courage on the battlefield. World Wwar 2 Christmas card from a U.Ss Navy flyer. Some cards were spectacular. 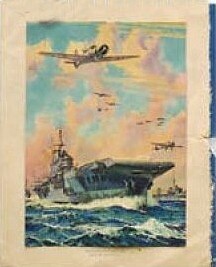 A 1943 greeting card from a US Navy flier features a color painting of an aircraft carrier, destroyers and aircraft in flight or taking off from the carrier. Inside the greeting hopes for peace, happiness and prosperity in the coming year. 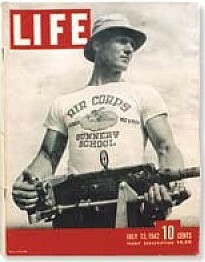 July 13,1942 cover of Life Magazine with an aircraft carrier gunner on the front. During World War II postcards continued to be popular. As in World War I cards featured the training camps, facilities where the individual was stationed. For US Navy fliers training at the Naval Training Air Station at Pensacola, Florida, the card front features aircraft in flight, navy ships in action. Of course there were restrictions on the material on a postcard due to war time censorship. One postcard from late 1939 or early 1940 features a British bren gun carrier column with the heading; “A mobile column somewhere in France, Britain Prepared.” Passed by Press and Censorship Bureau. Of course material connected to the enemy is sought after, as well. The Japanese sold postcards which picture Japanese soldiers on various islands. The interesting aspect of the postcard is the fact that the Japanese soldier face is blank. It was meant that the soldier could personalize the card by having his face pasted onto the blank face. 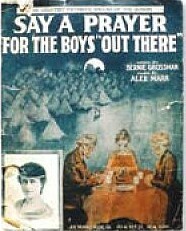 World War 1 sheet music "Say a prayer for the boys out there." Joe Morris Publishing Co., New York. In this age of ipods, picture phones and the 500 channel universe on television it is hard to remember that in World War I the main communication devise was the piano. In World War II it was the radio and movie theatre. The home fires were kept burning the morale of the troops through sing songs or propaganda played in the movie theatre. War time movies focused on the home front and the troops in the field. “In Which We Serve, Eagle Squadron, A Walk in the Sun, 12 O’ Clock High and hundreds of others. The movie posters and lobby cards have been a sub area of military collecting. 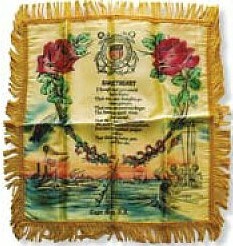 World War 2 satin pillow cover sent home from a member of the Coast guard. For the troops songbooks were issued to each. From “Trap, Trap, Trap, the Boys are Marching, There’s a Long, Long Trail A Winding, Keep Your Head Down Fritzie, We Saw You, to songs that would bring memories back of home to Sun-day religious songs. Each division had song leaders for sing along sessions. 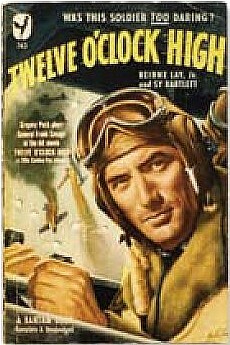 World War 2 paper back book of the movie Twelve O'Clock High, which starred Gregory Peck. In World War II, songs were a major part of keeping morale on the home front and battle front up. “Blue Birds Over the White Cliffs of Dover, Don’t Sit Under the Apple Tree, Here Comes the Navy and the all time favorite - I’m Sending You the Siegfried Line to Hang Your Washing On.” Besides collecting the sheet music of the songs the majority were issued on various 78 RPM records of the period. At the end of both World Wars collectibles were created by the goods manufac-tured by wounded soldiers in rehabilitation and many who would require sheltered full time employment. Starting in 1919 workshops for disabled soldiers were set up in Canada. One product that was manufactured were chalkware plaques that would hang in your home. The subject matter of the plaques featured soldiers with heads bowed praying for peace, an-other featured Nurse Cavell in her nurses uniform. The plaques contained a paper tag with the information on the organi-zation and the man that made the plaque. The majority are several inches in size, white, but some do have some items painted. On the back side is a wire hangar to allow the plaque to be hung. Many books were printed and published connected to World War I and II. One of the most sought after was issued in 1936 - “The Epic of Vimy.” Published by the Legionary - the Official National Magazine of the Canadian Legion of the Brit-ish Empire Service League. It was written an complied by W.W. Murray and tells the story in narrative and photos of the dedication of the Vimy Memorial. The book contains photos of the veterans that traveled to the event and at the back of the book the names of everyone that attended. It is rarely found. 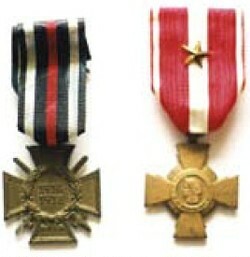 1914-1918 medal with black & red ribbon , and Croix de Valeur medal with ribbon & star Repbulic of France. The other main media vehicle in the 1930’s was the weekly magazine. Magazines were filled with the events of the period including the coming of World War II. Life magazine covers featured British airmen, children wounded in the blitz, airmen in training, German soldiers. One cover story featured the Americans that crossed the border to join the Canadian forces prior to the United States entering the war. Once the war was over Life featured an entire magazine on the new medical techniques that had been developed and in color photos showed various operations on soldiers. Life magazines and other usually can be found and purchased for $3 - $30 depending on the issue. The Eaton’s Company issued a company publication during the war. 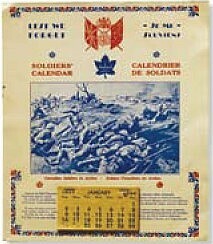 It featured events at the store in Toronto and items on the war. The May 21, 1945 is the Victory Issue and inside in a two page spread are the photos of the 78 Toronto Eaton employees that fought and paid the ultimate price. Overall 204 Eaton employees were killed in World War II. When collecting military items in the background is always the events that happened to create such an item. As the years move on it becomes harder to keep the memories and lessons of World War I and II focused upon.